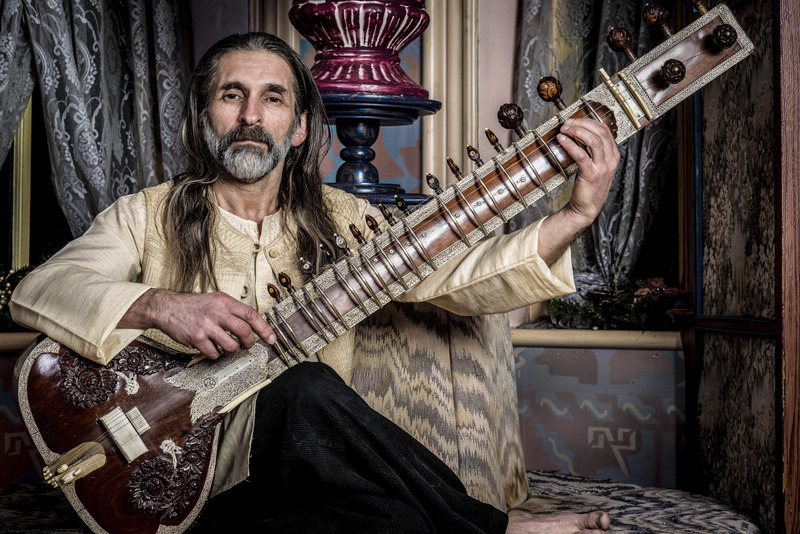 Sitar John Protopapas is primarily a World Music instructor at York College in York, PA. A study in diversity, John has a Greek background but grew up in South Africa and studied music in India. He lives in the USA where he teaches World Music, sitar, tabla and of course, Yoga, because, why not? The challenge in photographing someone as exotic as John, when you aren’t in an exotic location, is to fake it. For this shot, I looked for the most colorful and ‘exotic’ background I could find. What I settled on was some 1980’s era southwest pattern fabric, some hideous paisley curtains, and a completely unrelated urn. Put them together and they worked, if only for the unique patterns and colors that screamed ‘not from around here.’ They definitely transported John away from bland, Central Pennsylvania. His clothing and countenance completed the illusion. Once the background was set, I had to think about lighting. John has a beautiful, rugged face but he presents himself as Yoga instructor – with a kind of innocence that makes him look younger and fresher than his actual years. I wanted to get some character back into his face, even if it did make him look a bit more gritty. The best way to do this was to give him some mild split lighting by firing a monolight shooting through an umbrella. The umbrella softened the light just enough to keep it form becoming harsh. This brought out the character of his nose and some of the wonderful lines in his face, but it also took a little fill to keep him from looking craggy and hard. To tweak just the right amount of facial detail, I went into Adobe Lightroom and pushed the Clarity slider until I got to point where he looked just granular enough. The background came up a little more detailed than I would normally go – I’m not in love with the current trend of pushing Clarity to the point of making a shot look like it was hand drawn – but here, the Clarity bar took the photo exactly where I wanted it. At the end of post production, I also increased the Vibrance slider a tad more than normal. Again, it worked for this particular image.